After the first season of Shakespeare for Young Designers (SYD) at Great River Shakespeare Festival, my co-teacher Megan* and I questioned the structure we had designed for the program, the festival’s first foray into teaching design to middle and high school students. SYD had grown from our desire to offer an alternative entry point to theatre and Shakespeare through GRSF’s education programming by providing an artistic home to students who were interested in theatre but not necessarily in performance. The first year, the program ran ten days, and classes included daily drawing exercises, introductions to elements and principles of design, tours of the scene and costume shops, and text analysis geared toward design. As a culminating project, students selected a concept to research, sketch, render, and model for their own concepts of Romeo and Juliet. In this first iteration of the program, students spent the bulk of their time working on these projects independently, following their own historical and aesthetic interests. As facilitators, we primarily offered suggestions and feedback, hoping this freedom would allow ample space for students’ creativity and exploration. We learned a lot that first year. At the students’ showcase, we spoke with parents and community members excited by the presence of design education and impressed with the students’ work. The students themselves, however, while articulating their learning and enjoyment of the program, gave us the (obvious, in hindsight) feedback that 1) they wanted to spend more time working with each other and 2) that they wanted to realize their imaginings into a production, not just on paper or in a model. 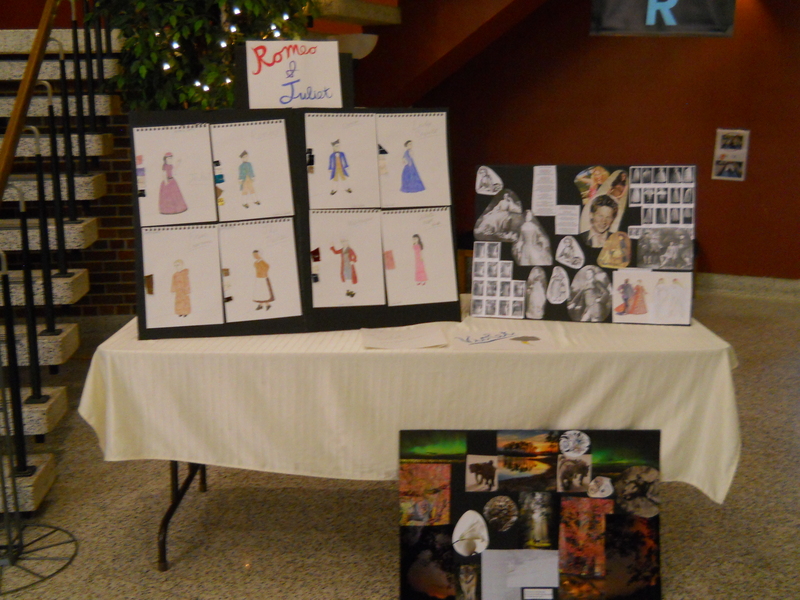 After all, the acting students’ experience culminated in a performance—why couldn’t their designs be part of that? We realized that we needed to adjust the program model to include more structure—more lessons in technique that students could apply in their later designs, more collaborative opportunities, more projects that could comprise a finished product—without compromising the learning of foundational skills and the creative process. For SYD’s second season, we made several important changes. GRSF is a text-based company, and this organizational priority lent itself well to guiding students to focus on clear visual storytelling that supported the narrative in Shakespeare’s language. This focus led us to more closely align SYD with the acting program, extending SYD to run the full three weeks to parallel Shakespeare for Young Actors. This allowed for additional collaboration and community-building between students in both programs, which we hoped might eliminate any divide between performers and designers right from the start of students’ theatre experiences. Second, with careful coordination with the actors’ lead teacher/director, the design students designed and built costume pieces and scenic elements to transform the festival’s unit set into the world of The Tempest. Because our students had more time and resources to dig deeper into analysis of Shakespeare’s text, they learned to focus on design elements that were essential for storytelling, lessening the temptation to add extraneous pieces for the sake of spectacle alone. To maintain the opportunity to learn design fundamentals and to make sure the show came together in three short weeks, our new structure segmented the activities students completed, allowing for a more balanced experience between individual and collaborative work. Week 1 focused on text analysis, drawing exercises, principles of design, how to complete visual research, and learning the plot, characters, and themes of The Tempest. During Week 2, students spent mornings individually sketching and rendering what we called their “bazillion dollar budget” projects, i.e. the world in which they can make any—textually supported—concept choice that interested them. 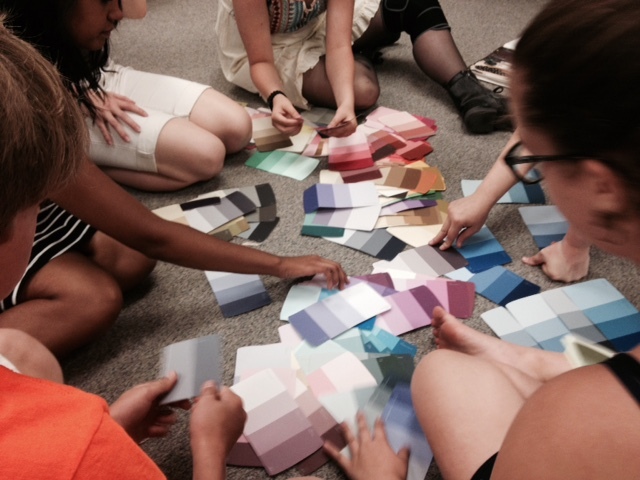 During the afternoons, they worked together to prepare for the production—researching, creating piece lists and collective color palettes, incorporating information from rehearsals as it became available (i.e. “The actor playing Trinculo needs to be able to do a summersault.”). They made collaborative aesthetic decisions, negotiating differences of opinion with the director and with each other, collectively establishing a cohesive world for the production. Week 3 became all about bringing this world to life—pulling props from stock, sewing trim on vests, modifying hanging nets to the height the director requested. After a room run-through and a single dress rehearsal onstage, the SYD students served as run crew during the performance, working together—with each other and the performers—to make their vision a reality. The palpable excitement from our students after their dress rehearsal—the designers to see their work come alive to tell a story, the actors to see and utilize costumes and props specifically created for them—let us know that we had moved in the right direction. In realizing their designs with a team of co-designers and performers in addition to putting their ideas on paper, our students embraced challenges and opportunities that more closely mirrored those present in a professional process, including those that involved respectfully interacting with other people’s bodies and ideas. Not only their collaborative skills grew, however; because they had practiced articulating their concepts for design presentations in rehearsal, the students developed skills they needed to defend their choices. As a result, their work grew bolder and clearer the more they talked about it. The production was stronger, the story clearer, precisely because they worked collectively as learners and artists, enhancing their collaborative and aesthetic skills in the process. All jobs in theatre are collaborative in different ways. Designers must have the ability to independently research, dream, create, receive and incorporate feedback, and ensure their ideas contribute to a production-wide aesthetic sometimes long before their creative team meets regularly in the same geographic location. Once the build period for their show begins, they must also be able to draw together a team of technicians to realize their vision, often with limited time and budget. It is this diverse skill set, this ability to move fluidly between individual and collaborative creation, that we hope to offer our SYD students the opportunity to explore and hone. *My official employment with GRSF ended following the 2014 season when I began graduate school. I had the pleasure and honor to return as a guest instructor during the 2015 season, and was reminded just how lucky I am to have the opportunity to collaborate with Megan Morey, an accomplished designer, technician, and GRSF’s technical director. She is the heart and soul of SYD, and I am proud to support her from afar as she continues to pursue innovative practices with SYD to better support students’ needs and interests. Lauren Smith is an M.F.A. candidate in the Drama and Theatre for Youth and Communities program at the University of Texas at Austin. She holds her B.F.A. in Stage Management and a minor in Education from Webster University’s Conservatory of Theatre Arts in St. Louis, Missouri. As a teaching artist, stage manager, and administrator, Lauren has worked with Great River Shakespeare Festival, Metro Theater Company, Children’s Theatre Company, the Repertory Theatre of St. Louis, Washington National Opera, Pittsburgh Opera, and Wolf Trap Foundation for the Performing Arts. She is excited about research and practice in arts-integrated instruction in public school classrooms and developing partnerships between nonprofit arts organizations and public schools.